Want to appear in a CC ad? Or win a $50 Visa gift card? Attend the casting call Sept. 24! 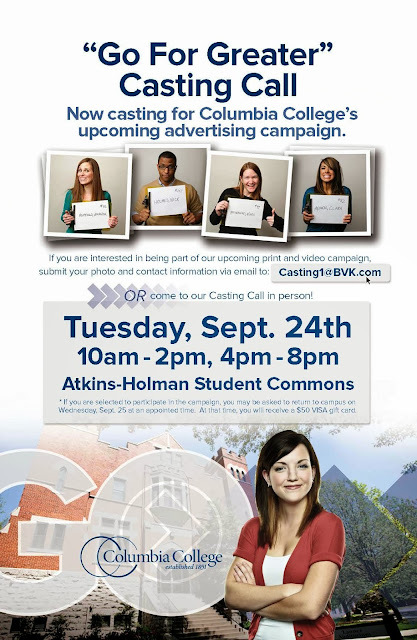 Would you like to appear in Columbia College's upcoming print and video advertising campaign? Submit your photo and contact information to Casting1@BVK.com or come to the casting call, which is open to all students and alumni, on Sept. 24 from 10 a.m. to 2 p.m. or 4 p.m. to 8 p.m. in the Atkins-Holman Student Commons. Selected participants may be asked to return to campus on Sept. 25, and these participants will receive a $50 Visa gift card. We hope to see you there! Thursday, September 19, 2013 Chk out- Want to appear in a CC ad? Or win a $50 Visa gift card? Attend the casting call Sept. 24!